Male/ Female DisplayPort Video Extension Cable - 6 ftExtend the reach of your DisplayPort devices by 6ft. The DPEXT6L 6-foot, DisplayPort Video Extension Cable adds an extra 6ft to any DisplayPort cable. The extension cable features latching, gold-plated connectors for superior conductivity. Extend the reach of your DisplayPort devices by 6ft. 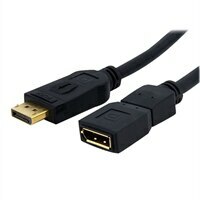 The DPEXT6L 6-foot, DisplayPort Video Extension Cable adds an extra 6ft to any DisplayPort cable. The extension cable features latching, gold-plated connectors for superior conductivity.